Chill Penguin, lord of the Snowy Mountain! Chill Penguin is the preferred choice for beginning players. He is the stage boss with the easiest difficulty to defeat, using a simple attack pattern you can memorize and react to with little effort on your end. Aside from a few slippery patches of ice and floor gaps in the more rundown areas of the base, there's not much danger to behold here. 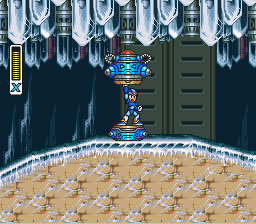 This stage is also ideal to tackle first because it is the only one that houses an armor upgrade capsule out in the open. Since the upgrade is a "freebie", you can obtain it without having to go on a manhunt, and it will aid you greatly throughout the later stages. This level is a little soft, but don't worry, you'll still probably take a beating somewhere in this stage. His stage is located in the South Pole. He once watched over for an abandoned missile base to keep it safe from intruders, but commandeered it in the Maverick rebellion. 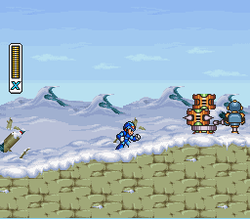 His area contains many arctic-themed Mechaniloid enemies and a suit of Ride Armor you can jack for your own benefit. The first enemy you'll face off against is a... rabbit?! This "rabbit" is called a Ray Bit (rimshot), and it bounds toward you with hops, then shoots lasers from its ear-like laser guns. Give it a good dose of bullets, but you might be annoyed with trying to hit it while its bouncing around. Several more are lurking further along the base. The enemy count is low here because Chill Penguin's outpost has fallen into ruin from disuse and was discarded. Whoever thought an Arctic base would be useful had the wrong idea at the time. Not as many Mechaniloids are necessary to defend such a low-priority place, but the missile stock inside the abandoned base located in the mountains was important enough to have some machines on guard to keep it safe. You'll soon come across an Axe Max. It is a stationary Mechaniloid equipped with an axe, and always stationed by a mechanical tree with three sections that keeps rebuilding itself. He'll swing at the regenerating stump with his axe, sending its sections flying in your direction. Each piece he launches will open up to reveal spikes, but they can be destroyed with Buster shots. You'll either have to shoot away at the stump sections to expose the Axe Max, or leap over the stump pieces entirely and bombard him with bullets, but the Axe Max will start swinging at you instead. The best way to take out this first one is to back up on the slope so you may position your Buster shots to make the projectiles go under the stump and hit his legs. If you are struck by a piece of the stump, the Axe Max will start laughing like a smug buffoon, but this will give you a perfect chance to blow it away with a Charge Shot! Watch out for the Bomb Beens! Wasp robots who dump mines from their abdomens until they run out of ammo, then dart offscreen in a swift retreat. Make sure you blast them before they drop the payload or run away quickly so you don't get caught in the bombs they drop. They are easy to dispel with the Buster, but pesky to get a lock on. You'll soon run into a cave full of Batton Bone bats and Spikys, spiked wheels. The Batton Bones explode with one hit. The Spikys are a bit more durable then you'd think and will take a little punishment before they get destroyed. Here's some helpful advice: if you hit a Spiky with a slightly charged Buster shot, the shot hits it with enough for to topple the Spiky on its side, and it needs a few seconds to right itself. Use that time to finish one off, but if you try this, the Spiky's leftover momentum makes it slide forward a little ways before it comes to a stop. On a sloped incline, knocking a Spiky over won't keep it from tumbling down very well. There is a tricky jump on the second level going up to the third; try to jump off the exact edge of the step and make sure to wall jump when your arm touches the edge of the platform. Dr. Light Hologram: "So you've come... X, I gave you the ability to choose your own path in life, and I hoped the world would allow you to choose a peaceful one. But now it seems that you are destined to fight. Because I thought the world might need a new champion, I have hidden capsules like this one. If you find and use them you will be able to increase your powers beyond anything the world has ever known. Step into this capsule and receive an acceleration system to boost your speed. Good luck, X! After Dr. Light's hologram finishes speaking, it will shut off, and you can step inside. X will start to glow and the capsule will start streaming green data bits into his body. A flash of energy will hit the red receptor on the capsule dome, transferring a brand new set of armor plates onto X's legs and boots. Please note that there is no way to avoid this upgrade beyond the realm of cheating. If you are attempting an enhancement-free run of the game, this is an unfortunate impasse. All you can do is enter this stage as the late as possible. 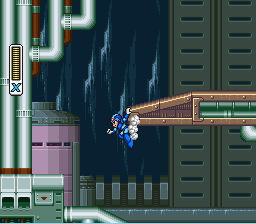 With a little help from Dr. Light's capsule, X can now dash! The capsule has transported a Foot Parts upgrade to X, now allowing him to dash! Tap while moving, and X will perform a dash. You can use this to gain a burst of speed and also better your dodging abilities. If you dash and press , X will leap into the air much faster than an ordinary jump and be able to clear a larger distance. 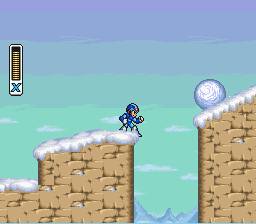 Try out your new gift by practicing the dash jump by dashing, and then jumping over the nearby pits in the icy floor. Simple, isn't it? But beware: there's no way to continue onward from the capsule without using dash jumps. The floor might make for some clumsy movement, but you can use the slippery landscape to propel you forward even faster! If you get good at dash jumping, you'll be able to zoom through levels and avoid enemies and projectiles better. Near the exit of the cave are some Flamingles. Flamingo-like Mechaniloids with saw blades mounted in their heads. If they spot X, they'll fling their heads forward 360 degrees and eject the saw blades at him, so you need to blast them away from a safe distance to avoid being sighted. It's not a good idea to try a direct attack; if you decide to attack a Flammingle head-on, it won't launch its saw blade, but will instead try to bash its skull into you with the saw still attached to it. Ouch! With a few decent dash jumps, you can also leap over them, though at your own risk. Although you might find a few lone Flammingles, there are more of those agitating Jamminger from the Highway Stage that swarm out. The best option here is to fire away and clear the path of all the Mechaniloids. Head out of the cave and once again into daylight! Well, not for long. You'll soon be trekking into a second section of the decaying base. Lucky for you, there is an abandoned suit of Ride Armor sitting in the snow, just waiting for a pilot to take control of it. You've already seen what Vile can do with on; how would you like to be the one with the mighty battle suit for once? Well, you finally can! Hop into the Ride Armor. Use the D-pad to control its movements, to jump high into the air, and to sling punches with its big fists. The Ride Armor is quite durable, but if you let it get heavily damaged, it will malfunction and overheat. You'll notice when it happens: you'll be unable to control the mech suit and it will start flashing. If it does, bail out right away! That mecha's gonna blow up on you! Press + and run away to avoid being hit by the blast radius. If you lose the Ride Armor or it explodes, you can always backtrack to where you first found it and it will reappear. Take command of the Ride Armor and advance through the base ruins. It's capable of demolishing the igloo-shaped domes in the mountains, some of which are actually releasing dragonfly robots, Tombots. They drop bombs much like the Bomb Beens, but they're not hard to dispatch. Destroy the Tombots before they flutter above you, which gives them a chance to rain bombs overhead. If you find an igloo dome spitting out waves of these bugs, it's time to act as pest control. Smack it to bits with the Ride Armor's fists to stop any more Tombots from coming out to rain on your parade. At some point, you can use the armor to jump up onto a higher section of roofing from a crumbled part of the base, but to reach it, you'll have to dismount at the height of the jump and continue on foot by wall-kicking off the side to get to the top. You can avoid some Tombots and an Armor Soldier this way. Take notice of the igloo domes up here. You're not able to destroy them, now that the Ride Armor is gone, but when you obtain Flame Mammoth's weapon, Fire Wave, you won't need the armor to do the job. One of these domes hides a Heart Tank upgrade, a small pink item shaped like a heart. You'll need to use the Fire Wave to destroy the right dome and expose the Heart Tank. It will expand your life bar by two units. 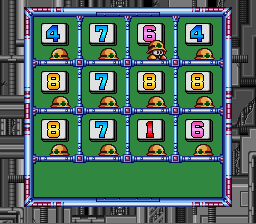 One Heart Tank is hidden in every one of the eight Maverick stages, letting you raise your life bar to a maximum of 32 hit points, doubling it from the initial 16. If you have grown fond of the Ride Armor, you might opt for the lower path and pass through the broken room below. Watch out for gaps! If you have to, you can always bail by pressing + . You can decimate most of the minor stage enemies with little sweat inside this suit, but sooner or later, you're bound to run into the dreaded Armor Soldier. This nefarious Mechaniloid is almost never without a suit of its own Ride Armor to back it up, and it pops up wherever you can equip a Ride Armor. You can go one-on-one inside of your own Ride Armor, punching away at its suit until it blows to smithereens. 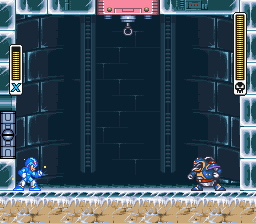 Outside of a Ride Armor, X is in a rough spot against an Armor Soldier, since his Buster attacks can't deliver as much damage to the soldier's suit as fast. A few solid kidney punches should bash away the Armor Soldier. Watch out for snow boulders! You'll run into a large blue wall soon after passing by it. The Ride Armor can't jump over this wall, forcing you to eject and leave it behind. Once you reach the far end of the cave, hop out of the mech and climb up the cliff. You'll have to face off against rolling snowballs and the culprits of these incoming attacks, Snow Shooters, snowball throwing robots. They use their scoop-shaped arms to cup a wad of snow and hurtle it at you. The snowballs will grow as they roll down the mountainsides, gaining speed. The bigger they are, the more they hurt if they slam into you. Jump out of the way before you get sacked in the gut with snow. It's not very difficult to cope with the Snow Shooters themselves; just keep your distance and get ready to jump over things. 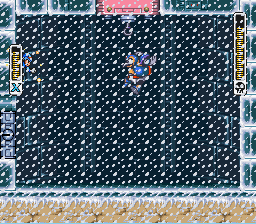 Note that you can destroy the rolling snow balls by shooting them a few times, so hold a charged shot as you proceed. Some places, like that shown in the picture, provide cover, allowing you to just stand still and let the snowball smash itself on the wall of the cliff. After you reach the top of the slope and defeat the final Snow Shooter, step through the vaulted door lock to face the first real boss. Chill Penguin was originally a Maverick Hunter from the 13th Polar Region Unit. He has flexible thought circuits in order to perform missions with such a small body, but his pensive nature created strong animosity between himself and Flame Mammoth. Their conflicting personalities, a strategic cool head and a brute force hot head, made for some malicious bickering. Fire and ice have never been known to get along in the same setting. Bored to death by his dull and dreary post at the quiet South Pole, he was unsatisfied with his lot in life. When he hear the 17th Battalion was revolting, Chill Penguin happily joined Sigma's rebellion, thinking it would be fun. However, he had a bigger motive to betray the Maverick Hunters. The Reploid also has a secret jealousy toward Mega Man X. This is partly because he disapproved of X's hesitation in battle, though X only did so to avoid hurting an innocent Reploid when it was captured by a berserk Mechaniloid. 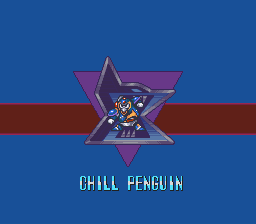 After seeing that X got a lot of favoritism as a Maverick Hunter and an active role in pursuing Mavericks, despite his hesitant nature, Chill Penguin felt that he was being shortchanged for all his hard work. If X wasn't making the most of his great power and abilities, then he didn't deserve the glory or status, let alone any abilities at all. In his book, he's the one who should be held in high regard. This knowledge, coupled with the insult of being assigned the most humdrum post in the Maverick Hunter ranks, was the final nail in the coffin for Chill Penguin. He quit the Maverick Hunters in a huff and didn't look back, knowing he was held in low regard. In reality, Chill Penguin was given his post for good reason. Some Hunters claim his flexible thinking ability has led him to contemplate some genuinely disturbing thoughts. He's been thought of as warped, and most Hunters are reluctant to pair up with him. With a little pressuring, the high-ranking officials of the Maverick Hunters finally caved into the Hunters' demands and distanced him from society. Looks like they were right to push him away. If he wants to take part in a rebellion just for some sick kicks, he really is off his rocker. It's time to send this loony penguin to the cooler. One of the easiest bosses of the game, Chill Penguin should only be able to damage you if you make a mistake like jumping in the line of fire. The best way to beat him is to let off a fully-charged X-Buster shot once you enter the room, then quickly scale the wall and continue to jump in the corner, as shown in the pictures. When you're in this spot, Chill Penguin will continue to launch attacks. Although he's one of the Mavericks that reacts well to the X-Buster, he does sport some defenses. Anything made of ice (his decoys and shots) will deflect shots, and he's invincible while sliding. He can do a variety of physical and projectile attacks. His most basic attack is to shoot a series of ice pellets at you. Some he'll shoot straight across at you at speed, others he'll send at a slower speed along the floor to throw off your timing. Since the pellets block shots, it's hard to get a hit on him here, but he tends to pause after a salvo, so once you clear the last pellet, send a shot at him. His other projectile attack is to blow freezing breath in front of him. This is both offensive and defensive, as the two ice decoys he produces with this breath can both block shots and damage you if you hit them. 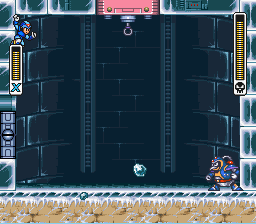 Furthermore, if you're careless enough to get within range of his freezing breath, X's legs will become frozen to the floor, leaving him unable to move until he's broken free with a hit. Every so often, Chill Penguin will leap up and grab the hook at the top of the room. When he pulls it, a blizzard briefly envelops the room. This won't hurt you, but it'll push you and any ice decoys in the room in the direction he's facing. Remember, decoys hurt you on contact. Chill Penguin is vulnerable both in midair and while he's hanging off the hook. Chill Penguin isn't afraid to slam into you. His most basic physical tactic is to slide into you along the icy floor. This also happens to clear any decoys already in play. He's invincible while sliding but vulnerable once he stands back up. Sometimes, Chill Penguin will just leap straight towards you. If you see him leap in an arc that doesn't take him to the hook at the top of the room, quickly dash under him, then turn around and get him as he's coming back down. Refer to the strategy above and you'll defeat Chill Penguin easily. Also note that his weakness is to the Fire Wave, which stuns him momentarily as he's covered in flames. This is handy for when you meet him gain in Sigma's fortress. Once beaten, Chill Penguin will die in a explosive burst that tints the screen red. Congratulations! You've put an end to the bitter bird and freed the Snow Mountain from his control. X's Variable Weapons System will now copy the Maverick's signature weapon and bestow him with a new ability: Shotgun Ice! This shoots a single blast of ice that shatters on impact, spraying five shards of ice that do the same amount of damage as the first projectile backwards. You can shoot this against walls to spray projectiles towards your enemies from various directions. 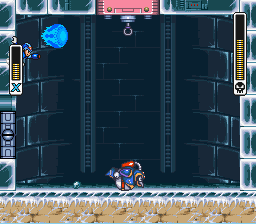 When you obtain the X-Buster upgrade, you can charge Shotgun Ice to a second level and it will make a snowboard in the shape of Chill Penguin that you can ride for a while and send crashing into enemies. After defeating Chill Penguin, Flame mammoth's factory stage will be affected. All floors covered in harmful molten metal will cool down, and will become safe to walk. This page was last edited on 11 October 2018, at 16:25.